In celebration of this auction event, The King will make a special appearance with one of his historic cars—his 1992 Pontiac Grand Prix with his hallmark No. 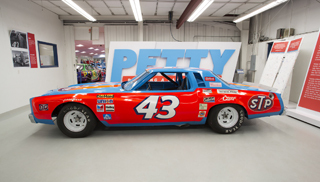 43 that Petty drove during his 1992 Fan Appreciation Tour before he retired from racing at the end of the year—and other highlighted items, at Planet Hollywood Resort & Casino in Las Vegas on March 2nd at 2:30pm PST. Born July 2, 1937 in Level Cross, North Carolina, Richard Lee Petty is a second-generation driver whose late father, Lee Petty, a three-time NASCAR Champion, was the patriarch of the Petty family-racing dynasty. At the age of 21, Richard Petty embarked on his NASCAR career and was named NASCAR Rookie of the Year in 1959. In 1960, he produced his first career win at the Charlotte Fairgrounds Speedway and throughout the decade broke out as NASCAR’s greatest star, capturing the Daytona 500 twice as the first driver to accomplish this feat. In 1967, Petty collected 27 victories, including 10 in a row, both still NASCAR records. On the Fourth of July in 1984, Petty triumphed in one of the most memorable races in history at the Firecracker 400 at Daytona International Speedway, beating Cale Yarborough in a breathtaking final lap. Petty’s historic 200th race win, which he rode to victory in his trademark No. 43 STP Pontiac, was attended by President Ronald Reagan, the first President to attend a NASCAR race. Petty retired after the 1992 season finishing an illustrious racing career that resulted in records and honors unmatched by any other driver in history including being named NASCAR’s Most Popular Driver eight times; inductions in the Motorsports Hall of Fame of America, the International Motorsports Hall of Fame, the inaugural NASCAR Hall of Fame, the North Carolina Auto Racing Hall of Fame and the North Carolina Athletic Hall of Fame; and receiving the Presidential Medal of Freedom, the first ever to be given to a motorsports athlete, bestowed by President George Bush in 1992. 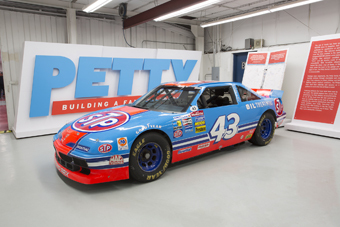 Petty’s legacy continues to make an impact on and off the track with his work overseeing his race team Richard Petty Motorsports, Petty’s Garage high performance speed shop and the Petty Museum, as well as his donation of land to build Victory Junction, a summer camp for children with various medical conditions. He also is the co-founder of the Petty Family Foundation. 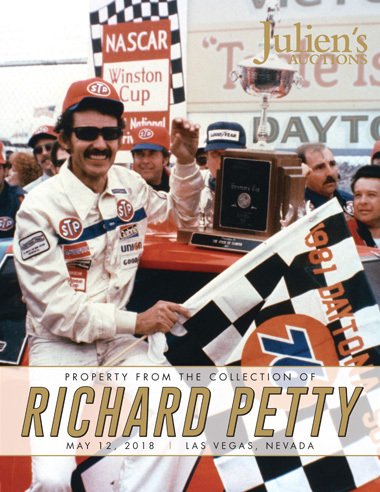 "As Babe Ruth and Muhammad Ali were giants in their arenas, Richard Petty is one of the most significant sports figures of our time who elevated the world of motorsports to greatness," said Darren Julien, President/Chief Executive Officer of Julien’s Auctions. 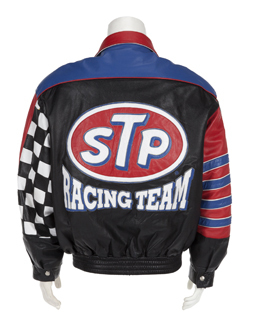 "He is a national treasure and Julien’s Auctions is honored to offer this winners circle of iconic items that represents The King’s legendary career, life and love of racing." 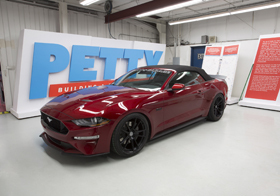 a 2018 Ford F150 (estimate: $80,000 - $100,000) and a 2018 Ford Mustang (estimate: $80,000 - $100,000) (photo left) both built professionally in Petty’s Garage; a 2009 Budweiser Dodge driven by Kasey Khane who won at Sonoma in 2009 (estimate: $20,000 - $40,000); a 2008 Victory Motorcycle (estimate: $6,000 - $8,000) made by Polaris, driven during the Kyle Petty Charity Ride (photo top left); Petty worn STP signed leather racing jacket (estimate: $1,000-$2,000); a Bobby Labonte signed Cherrios racing suit (estimate: $800-$1,000); a Marathon racing suit bearing Terry Labonte’s name (estimate: $800-$1,000); a vintage Lee and Richard Petty oil tank and pump used during the late 60s (estimate: $1,000-$2,000). The auction will also offer memorabilia and personal items including race programs, license plates, posters, trading cards, plaques, clothing and more. 3667 Las Vegas Boulevard S.
Submit a bid in person at the Planet Hollywood Resort & Casino. Julien’s Auctions is the world record-breaking auction house to the stars. Collaborating with the famous and the exclusive, Julien’s Auctions produces high profile auctions in the film, music, sports and art markets. Julien’s Auctions has received international recognition for its unique and innovative auction events which attract thousands of collectors, investors, fans and enthusiasts from around the world. Julien’s Auctions specializes in sales of iconic artifacts and notable collections including Marilyn Monroe, John Lennon, Ringo Starr, Lady Gaga, Banksy, Cher, Michael Jackson, U2, Barbra Streisand, Les Paul, Bob Hope, Elvis Presley, Frank Sinatra, Jimi Hendrix and many more. In 2016, Julien’s Auctions received its second placement in the Guinness Book of World Records for the sale of the world's most expensive dress ever sold at auction, The Marilyn Monroe "Happy Birthday Mr. President" dress which sold for $4.8 million. Julien’s Auctions achieved placement in the Guinness Book of World Records in 2009 for the sale of Michael Jackson’s white glove which sold for $480,000 making it the most expensive glove ever sold at auction. Based in Los Angeles, Julien’s Auctions has a global presence bringing their auctions and exhibitions to targeted destinations worldwide including London, New York, Las Vegas, Japan and China. Live auctions are presented for bidders on-site and online via live streaming video and mobile technology. 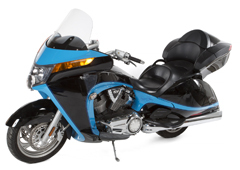 For more information, go to www.juliensauctions.com. Connect with Julien’s Auctions at www.facebook.com/JuliensAuctions or www.twitter.com/JuliensAuctions or www.instagram.com/juliens_auctions. Celebrating 10 years, Planet Hollywood Resort & Casino is the centerpiece of the famed Las Vegas Strip, with 2,500 beautifully redesigned guest rooms and suites showcasing some of the best views in town, along with endless options of unparalleled shopping, distinguished dining, popular entertainment and a bustling nightlife. A bright, bold addition to the resort’s portfolio, the new Ultra Hip Rooms feature contemporary elegance and luxury bedding. Known as the place to play for its roster of A-list celebrity guests, Planet Hollywood’s 231 newly restyled suites feature stunning views of the glittering skyline and daring décor elements such as suspended sofas, lounge-style living spaces and oversized modern artwork. The resort encompasses more than 100,000 square-feet of gaming, several lounges, ten restaurants including Gordon Ramsay Burger, KOI, Strip House, Cafe Hollywood, the award-winning Spice Market Buffet and LA’s Pink’s Hot Dogs, an intimate wedding chapel and the Planet Hollywood Spa by Mandara. Home to the first pop music residency in Las Vegas, The AXIS showcases resident headliners Jennifer Lopez, Lionel Richie, Pitbull and Backstreet Boys. The property is encircled by Miracle Mile Shops with more than 170 specialty stores and restaurants. For more information, please visit planethollywoodresort.com or the Caesars Entertainment Las Vegas media room. Find Planet Hollywood Resort & Casino on Facebook and follow on Twitter and Instagram.